I can’t believe we’ve reached the end of the 12 Days of Christmas Treats. Trust me when I say I’ve been looking forward to this series all year, and that I’ve already started planning next year’s treats! 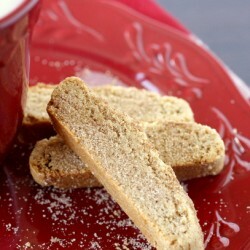 I saved one of my favorite cookies for the last day – these thick and chewy gingerbread cookies! The cookies themselves are thick and chewy (as thick as you roll them out to be) and heavily spiced with a delicious gingerbread flavor. The recipe comes from one of my best friends from college, Becky. After we graduated from college, Becky and I would get together every year to bake cookies together. These gingerbread men were a staple of our yearly cookie baking. The recipe actually comes from her mom, who I believe tore it out of a magazine years ago. Unfortunately, cookie baking is no longer a yearly tradition, due to the fact that we now live halfway across the country from each other. Thankfully Becky was kind enough to send me the recipe when I asked for it. It brings back such good memories when I make these, and it always makes me think of Becky and her mom. Don’t you love cookies with a history? Notes: This recipe makes about twenty 5-inch gingerbread people or thirty 3-inch cookies. Because flour is not added during rolling, dough scraps can be rolled and cut as many times as necessary Don’t overbake the cookies or they will be dry. Store soft gingerbread in a wide, shallow airtight container or tin with a sheet of parchment or waxed paper between each cookie layer. These cookies are best eaten within one week. In food processor workbowl fitted with steel blade, process flour, sugar, cinnamon, ginger, cloves, salt, and baking soda until combined, about 10 seconds. Scatter butter pieces over flour mixture and process until mixture is sandy and resembles very fine meal, about 15 seconds. With machine running, gradually add molasses and milk; process until dough is evenly moistened and forms a soft ball of dough, about 10 seconds. In bowl of standing mixer fitted with paddle attachment, stir together flour, sugar, cinnamon, ginger, cloves, salt, and baking soda at low speed until combined, about 30 seconds. Stop mixer and add butter pieces; mix at medium-low speed until mixture is sandy and resembles fine meal, about 1 1/2 minutes. Reduce speed to low and, with mixer running, gradually add molasses and milk; mix until dough is evenly moistened, about 20 seconds. Increase speed to medium and mix until thoroughly combined, about 10 seconds. Adjust oven racks to upper- and lower-middle positions and heat oven to 350 degrees. Line two cookie sheets with parchment paper. Remove one dough sheet from freezer; place on work surface. Peel off top parchment sheet and gently lay it back in place. Flip dough over; peel off and discard second parchment layer. Cut dough into desired shapes and transfer the shapes to your parchment-lined cookie sheets. Space them at least an inch apart. Repeat with remaining dough until cookie sheets are full. Bake cookies until set in centers and dough barely retains imprint when touched very gently with fingertip, 8 to 11 minutes, rotating cookie sheets front to back and switching positions top to bottom halfway through baking time. Do not overbake or they won't be chewy. Cool cookies on sheets 2 minutes, then remove with wide metal spatula to wire rack; cool to room temperature. Gather scraps; repeat rolling, cutting, and baking with remaining dough until all dough is used. Megan — these are so cute!! I love a good gingerbread cookie, and with that frosting… yum! I've enjoyed all the recipes. These cookies are adorable! So cute!!! I would feel bad eating them, although can imagine how chewy and sweet they are. These look incredible! What a great frosting job! I'm awful at frosting gingerbread men. I'm so excited to see that the 12th day of treats are gingerbread cookies (obviously! haha)!! Wow, I am SO impressed with your decorating skills. I can't say enough about how amazing of a job you did. And I'm glad you shared so many photos! Not to mention they look sooo delicious. Megan they are beautiful! If this is only your second attempt at decorating I am highly impressed!! These are perfectly decorated! How did you do it!? Your cookies make me want to run out and make them immediately! Your cookies are so adorable! 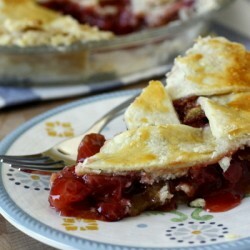 I have that same recipe and LOVE it! It's recipes and pictures like yours that get people in the mood for the holidays…Gingerbread is perfect for making memories, an unforgettable taste, aroma, and friendship. I will definitely add this one to my cookie baking day (with friends) next year. The cookies look and sound great! 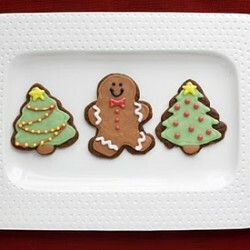 I've never tried making homemade gingerbread cookies, but your description of these makes them sound amazing! SO cute! The best for last, right?! Wow these cookies look amazing! You did a great job decorating them(: I'll have to try this recipe, the last time I made gingerbread cookies they didn't turn out so great. Just wanted to let you know that I was a barista at Starbucks until October and had to make your Cranberry Bliss Bars since I've been missing the ones there. They are really close (a bit lemony in the frosting compared to the stores and no white chocolate in the drizzle) and hit the spot. The friends we shared them with this weekend loved them as did Hubby and I…we'll be making them lots. And saving loads of money on the SB ones! Thanks for a great series. We're doing the cookie dough truffles as soon as I get sweetened condensed milk and we finish the mocha truffles I made last week! Love ginger cookies, these are at the top of my list. These are so cute! You are one talented woman! 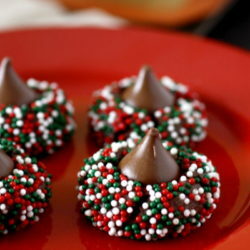 These look so cute and yummy! Have definitely enjoyed your 12 days of Christmas!!! Heather – Thanks so much for your comment! I'm so glad to know that the cranberry bliss bars live up to your expectations. It's nice to have an “expert” opinion 🙂 Hope you enjoy the cookie dough truffles as well! so, so cute!!! Love that little gingerbread man! Those are on my to-do list this week. You did a beautiful job decorating them! I am horrible at decorating cookies so you have impressed me! What a wonderful story behind the gingerbread. i love this post.. and the gingerbread men looks so cute:) thanks for sharing this. These look too cute! I'm going to try your recipe out this weekend when I do my official gingerbread day 2010 lolz. I also want to try and recreate some of these gingerbread houses, any suggestions?? SO SO cute!!! you did a great job! Great job Megan! These are ADORABLE! You have mad skills and patience decorating all these cookies. Your cookies are so cute! Bravo! I love gingerbread cookies, especially when they are chewy. Mine often turn out more crisp than chewy, so I'll have to give this a try. you had me at chewy . 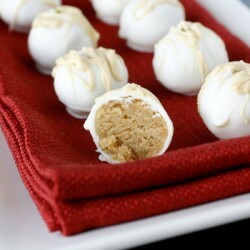 . . i cant wait to make these. mmmmm! thanks for the great holiday recipe. i love chewy gingerbread! Great recipe! I really like to spice mine up, so I doubled all the spices and they were fantastic. Made a batch last night. Kimberly – I'm so glad you liked these! I bet the double spices were wonderful 🙂 Thanks so much for taking the time to leave a comment! Made these cookies yesterday and they were fabulous!!! Soft and chewy with a nice, dark flavor. Thank you for such a great recipe! Substituted sorghum for the molasses, ground the cloves myself – and this is an AMAZING COOKIE! THANKS! Just wondering what you used to tint the brown icing? I used Wilton brown gel food coloring. What a delicious cookie! These have a wonderfully spicy taste! I love the flavor of gingerbread. Thank you for such a great recipe. Made the cookies for Christmas and everyone loved them. Was not able to decorate as cute as you did but still tasted delicious . Will us your recipe only from now on. Thanks! This is the EXACT same recipe as one that was posted on another site a year later, except for the amt. of Butter – yours calls for 12 T., and the other one calls for only 6 oz. Which amt. of Butter should produce a softer, chewier cookie (desirable qualities for me)? What was your icing recipe?